The TPP is a trade partnership that is going to change the liaisons within Latin America & the Caribbean (LAC). Repercussions are expected in the labor market and in the political structures. The strong economic growth during the last decade was not sustainable and the diversification of the production system of most of the countries in the region was postponed due to a lack of infrastructure and weak alternative sectors of the economy. While the geopolitical implications of the agreement are currently in debate, governments and civil society remain skeptical of the effects of international trade agreements for development. In order to achieve a genuine integration of Latin American economies, the antagonist positions on the agreement must also be considered. Latin America and the Caribbean (LAC) is a region marked by volatility. Economically, a great boost was experienced during the last decade, mostly driven by the dynamism in the commodities prices and the higher liquidity in the financial markets of emerging economies. Additionally, the good management of the macroeconomic policies allowed internal economic stability during these unpredictable cycles. Asian demand propelled the terms of trade for many countries in the Latin American region. Particularly China increased its demand for commodities, which led to greater volumes of exports coming from South America, while the countries in the Caribbean did not really benefit from it. As a result, South American countries enhanced and increased their terms of trade, while the countries in the Caribbean were loosing out comparatively. Less than a handful of countries (Argentina, Bolivia, Chile and Venezuela) reverted a negative trade balance in the past decades. 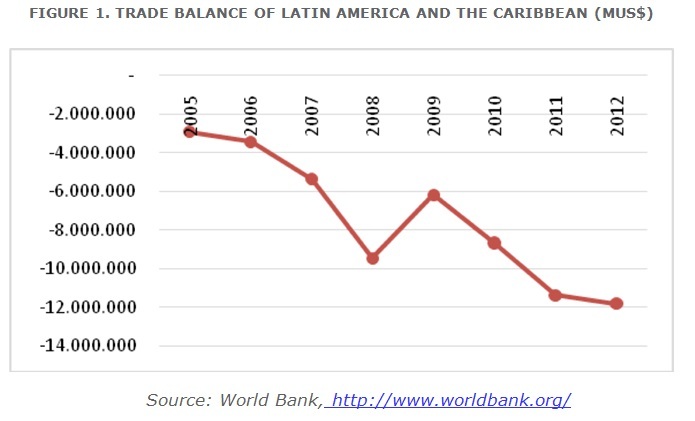 Imports remain still dominant in the trade balance of the LAC countries. 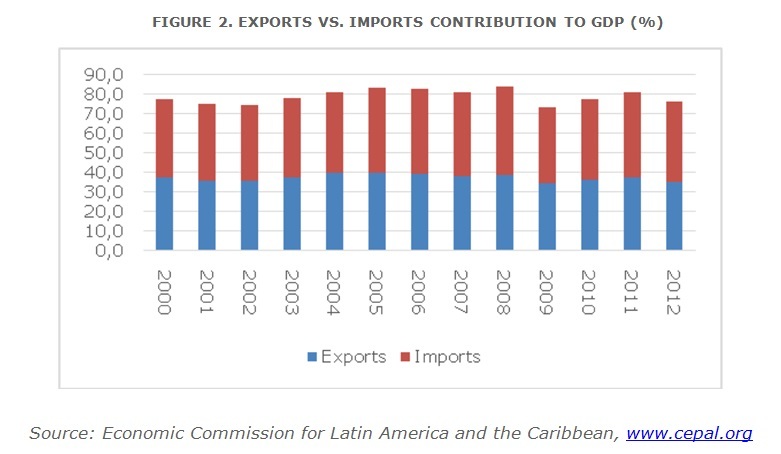 Even though many trade agreements were signed under the flag of diversification and competitiveness the LAC region as a whole has increased its trade deficit between 2000 and 2012 (Figure 1) and overall exports have become less significant in terms of GDP (Figure 2). The TPP establishes a new framework of tariffs and a free trade zone between twelve countries. Three of these countries are from Latin America and the Caribbean while the rest is well located in the Asia-Pacific region. The signatories are Chile, Mexico, Peru, Canada, the United States, Brunei, Japan, Vietnam, New Zealand, Singapore, Malaysia and Australia. It was signed the past February 4th and it is currently being debated internally in each of the signatory countries. It is expected that following the debates and the approvalof the respective parliaments, the agreement will be put in place and executed. Whereas the agreement establishes standard trade procedures and tariffs for most of the sectors of production, labor laws and certain industries such as automobile, textile, pharmaceutics and public government purchases remain highly debated. As a result of the aprobation process, around 1.600 new products will be traded freely. Trrade between the signatory countries is very significant, amounting to approximately 45.000 million dollars per year. Including no less than 40% of total GDP, the TPP is expected to have an impact on the economic structure of the world. Currently, the most debated concern involves the labor market repercussions due to trade diversion. Trade diversion refers to the change in the composition of imports and exports driven by external incentives such as new trade regimes. Explicitly, trade agreements can change the production structure of an economy by shifting labor demand and supply in favor of the export sectors due to the newly achieved external trade incentives (e.g. lower tariffs). These changes can affect the market prices by stagnating salaries in other sectors and through different consumption patterns of low-income households. Another consequence is the change in the inflow and outflow pattern of investment. The volatility of short-term investment flows can have negative consequences for some of the very small financial markets of Latin American countries. On average, according to a recent study , the TPP is expected to have little impact on the growth of exports for the next 15 years in the economies of Mexico, Peru and Chile. According to the study the growth of Chile's exports is expected to reach 5.3% by 2030, while Mexico is expected to grow only 4.7% for 2030. In the case of Peru, a net export growth to 2030 of 10.3% is expected. According to these numbers, the initial shock expected from TPP is only marginal and not as significant compared to other free trade agreements signed in the past (e.g. NAFTA). Over the past 10 years, Peru has signed trade agreements with major partners who have considered its geographical position strategic in the commercial and the geopolitical sphere. Until today Peru has signed a total of 21 preferential trade agreements. Currently China is the most important trade partner for Peru. About 55% of copper exports, the main mineral exported by Peru, were requested by China. Likewise, on average 80% of technological products are imported from China. 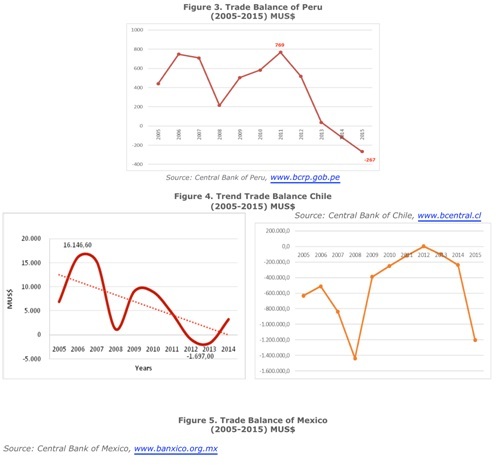 Peru's trade balance is now in deficit for the second consecutive year, below twice the value of the previous year (US$ -117 mio in 2014 compared to US$ 267 mio in 2015). As shown in Figure 3, the trade balance peaked in 2011, but has been declining exponentially since then. The free trade agreement with China, which entered into place in the very same year, possibly contributed substantially to increasing the trade deficit. In 2014, the country recorded a surplus in its trade balance, equivalent to 1.67% of its GDP, which represents a major change from the previous year, when the trade balance was negative and recorded a deficit of U$ 1.697 mio. The change in the trade balance was due to a decline in exports responding to the low commodity prices. Chile has signed free trade agreements with several countries in the Pacific region (e.g. United States and Japan). It should be noted that except for Brunei, Chile established bilateral trade agreements with almost all member countries of the Pacific Agreement. Nevertheless, like Peru, Chile is a big exporter of primary gooods and its main trading partner is China. While the majority of Chile´s exports are currently copper related (22%), the TPP represents a great opportunity for Chile to diversify its exports (e.g. agricultural products) and to participate in the global value chains that could increase its visibility in the Asia-Pacific region. The trade balance of Mexico is also in deficit. A great proportion of its trade is driven by imports. However, contrary to Peru and Chile, Mexico is an exporter of more technology-intensive manufactured products. Therefore, Mexico is perhaps the only of the three countries that will retrieve substantial benefits in terms of technological upgrading from the TPP, particularly because it is a big exporter of automobiles, a product that is much more technology-intensive than the extractives industries. In Mexico, the agricultural sector accounts only for 13% of employment (2013), while the services and industry sectors account for 62% and 23%, respectively. As Mexico’s economy is in a higher level of industrial development, the TPP might rather boost existing sectors than leading to a greater diversification of the economy. Latin America has been traditionally an exporter of primary products, and historically and geopolitically natural resources and commodities have played an important role in determining their economic structure. The geopolitical aspects of the agreement can therefore not be undermined, especially regarding the predominance of the United States as the leading negotiator of the TPP. With continuing political and economic tensions between the US and China it can not be denied that the TPP also serves as a strategic deal for the US government to counterbalance the Chinese presence in Latin America, which has been growing strongly over the last decade. Latin America and the Caribbean is a fragmented region. Currently, there are 20 organizations and sub-regional political and economic associations in the region. Ideologies and very distinctive political opinions are a major problem that increases the fragmentation within and across the borders of each country. Furthermore, the autonomy of the governmental institutions is compromised through often poorly managed international relations with extra-regional actors. The problem of bad monitoring of policies has resulted in a major setback in social and economic planning. In the region, neither Peru nor Chile have established a strong and influential position. Important member countries of other relevant regional associations such as MERCOSUR and ALBA were not considered as part of the agreement. Among the countries of Latin America, the biggest markets of the region (Argentina and Brazil) have decreased their trade liaisons affecting the overall performance of the region. While Brazil prioritized to tighten its relationship with the other BRICS, particularly with China, Argentina relied on protectionist policies in the past such as the raise of tariffs on foreign imports. These policies were pursued with the purpose to foster the industrialization of the economy but historically they have shown not to be a successful strategy for the countries of the region. Most importantly, the predominance of the export of primary products over value added products is going to compromise the long term conditions of economic development of the region and the TPP will not change this in the short-term. Unfortunately, the diversification agenda has not been addressed intensively by the LAC countries that experienced higher growth during the commodity price boom. Besides the missing policies, also the investment in diversification of technological industries has been very low within the region. Mexico is the only country, among the ones analyzed, that has started an industrial agenda towards producing more technology-intensive goods. Nonetheless, the impact of trade agreements on their industrial activity is not bigger today than it was 10 years ago when NAFTA and other trade agreements came into place. Knowing that pure reliance on the trade of primary products implies a slow growth path in the long-run, the next episodes of commodity booms need to be followed closely by policy makers to better analyze and take advantage of the opportunities of a positive price cycle. This is important to achieve sectorial industrialization and fairer employment conditions. Secondly, the region is not strongly integrated, as most of the countries prefer to remain unlinked to antagonistic governments in the region. This led to some political divide with Chile, Colombia, Peru and Mexico employing a more liberal profile on the one side and Brazil, Bolivia, Venezuela and Ecuador with a more leftist profile on the other. Latin American countries, whether they are part of TPP or not, should be aware of the repercussions of the agreement, not only economically but geopolitically. As a group of countries with a similar social and cultural background, the LAC region should play a protagonist role in its own domestic policies for development and seek to be less influenced by the economic liaisons with external partners that could contribute to crack, once again, the process of regional integration. Finally, while the geopolitical aspect of the TPP will probably remain hidden as governments draw the attention towards the possible economic benefits, a dominance of the more advanced economies and their particular interests in the structure of the TPP negotiations cannot be denied. 1. Viner, J, “The Customs Union Issue”, Carniege Endowment for International Peace, New York, p.43. 1952.